For most of the last 25 years, I’ve worked with people to help them comfortably transition into retirement. But in an unexpected way, that’s all changed. Today, I spend as much time and energy helping people plan how not to retire, as I do helping people prepare to stop working. A woman I’ll call Barbara recently came in for an appointment to review her financial goals and retirement plan. As the CEO of a successful mid-sized business, Barbara is very good at what she does. So, not surprisingly, financially, she could retire at any time. She looked at me quizzically, chuckled, and we moved on. Many of our clients are discovering that the traditional notion of retirement—quitting work and engaging in full-time leisure—is not only undesirable, it doesn’t make a lot of sense when you consider exploding healthcare costs and rapidly rising lifespans. But there seems to be an even more important reason: Boomers realize that work is an integral part of life that provides meaning and purpose. Fact #1: Working retirees are 3 times more likely to start new businesses than pre-retirees. Consider: Retirement-age entrepreneurs are called “retire-preneurs” by some experts. Essentially, you are leveraging work experience, passions, and expertise into a full-time or part-time business venture. Called “slash careers,” lawyers become writers, bank executives become chefs, and middle managers become wedding photographers. Consider: Do you have an outdated notion of retirement that says, the earlier you retire, the better? Take a look at the cognitive and physical benefits of continuing to work, by staying engaged in meaningful activities, even if it’s not your career job. Fact #3: 1 in 7 people age 50 and older are divorced, a rate that has doubled since 1990. Interestingly, this “grey divorce” epidemic comes at a time when rates have declined in every other demographic. Consider: 42 percent of people over the age of 65 are single. If you find yourself single, would you have to stay in your career longer? How would that impact your finances? Consider: Signing up for a class at the local community college or online to learn about a new subject or area of interest, especially if it involves computers. 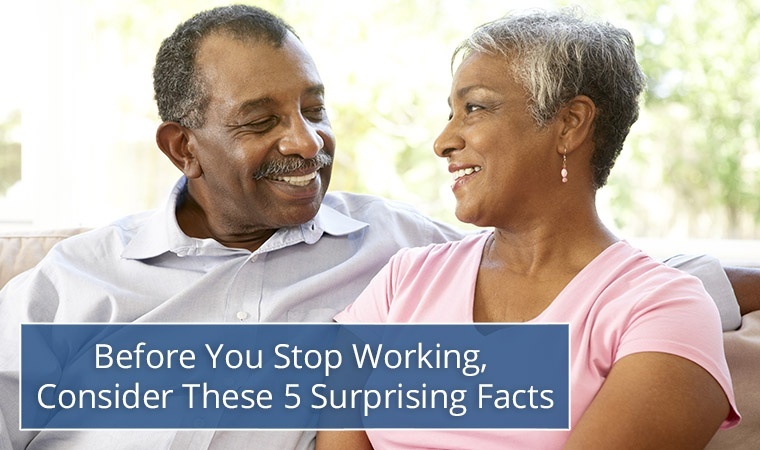 Fact #5: 4.5 million people between the ages of 50 and 70 are engaged in working in a second career for motives other than earning a paycheck. Consider: Redeploy your professional and interpersonal skills as a coach. Take what you gained during your first career to help others in your “next stage.” There are many groups of people who would benefit from your life experience, maturity, and wisdom. A final thought: While the transition to retirement is first a financial question, it’s clearly not the only question, and perhaps not even the most important one. Now is the time to think about and plan for the experiences you want to have. A study of nearly half a million people by French researcher Carole Dufouil of the research agency INSERM, presented at the Alzheimer's Association International Conference in July 2013.